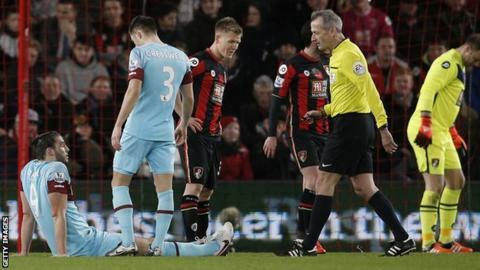 West Ham have a new injury worry after striker Andy Carroll was substituted with a hamstring problem in the Hammers' 3-1 win at Bournemouth. Carroll was forced off after 15 minutes and manager Slaven Bilic says the injury will be assessed on Wednesday. "It's a big blow for us because he started this game good," said Bilic. "I don't understand it because we're resting the players. We're not training a lot. We can only hope it won't last that long." The 27-year-old has scored two goals in West Ham's past four games after returning in September 2015 following seven months out for knee surgery. A former Newcastle player, Carroll joined West Ham from Liverpool for a club record £15m in June 2013.